Welcome to the office of Dr. David M. Rizk. From the moment you pick up the phone to schedule an appointment, we want you to feel at ease. Our team is caring, professional, and thorough, and we always have your best interests at heart. This dental practice was designed with your comfort in mind, from the warm and welcoming wood and stone décor to the Tempur-Pedic chairs in the exam suites. We feature artwork by local artists and professional portraits of our favorite models — our happy patients. While we hope the surroundings make you feel comfortable, we know for sure that our expertise will! 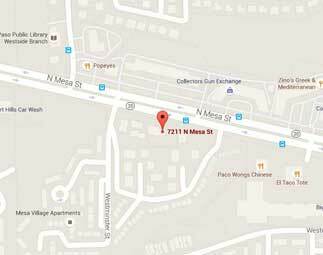 Practicing at his current El Paso location since 1996, Dr. Rizk has more than 25 years of experience. He and his team have received extensive continuing education in order to bring you the highest level of care with the most up-to-date procedures in dentistry today. And he has invested in top-of-the-line technology – from lasers to 3D imaging devices – all to provide you with unparalleled treatment. Though we provide comprehensive preventive dentistry and cosmetic services, Dr. Rizk focuses in treating patients who have lost all hope of ever seeing their smiles again. If you’re missing one or more teeth due to accident, injury, illness, or decay, Dr. Rizk offers implant dentistry services that are sure to return your grin and your self-confidence. 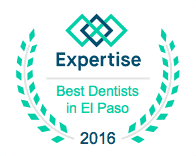 We are proud to have been voted one of the top 20 dentists in El Paso based on Expertise.com‘s rigorous analytical criteria. Whatever your dental concerns may be, please contact us to schedule a consultation. At the office of Dr. Rizk, your concerns become our concerns, and your comfort becomes our top priority. He was excellent and pulled my wisdom tooth in less than 2 min. w/o chipping it. The service was good too. Great dentist experience! While they do take my insurance, unfortunately, they are not part of my network, however, I liked them so much I will continue to see them. We were very impressed with the helpful and friendly staff at this dental office. I was very impressed and thankful with the service provided. I’m 60 years old and I hated to go to the dentist, and put off going for a long time. But let me tell you Dr. Rizk is the best dentist I’ve ever had. I would of gone years ago. A no pain Dr. – thank you!